There is info from town official home page at <www.gulbenesdome.lv>: On 4 July 2002, Latvian State Comitee for Heraldics was accepted sketch of flag of Gulbene - author is teacher of Gulbene Art school Sandra Dikmane. 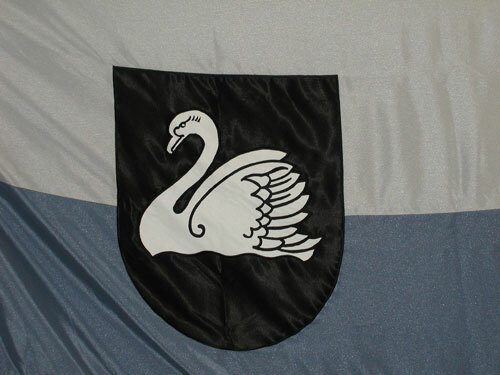 In centre of flag is Coat of Arms of Gulbene - silver swan on black field. Flag is divided in two parts - upper is silver light gray [again unheraldic concept! ], lower part - blue-grayish-violet [sic!]. Proportions 1:2. Citizens of gulbene first time were introduced with flag at Town Fest 2002, when flag was consecrated. Now flag is keept in Town hall and is used in all important town activities. António Martins asked: Meaning that there is only one copy of the flag?! Probably yes but maybe it means an consecrated and specially sewn flag with fringe (You can see it on photo) In Latvia flag is widely used only in couple municipalities: Riga, Ventspils and may be in some others. In small towns flag often is used like Standard - sewn in one exemplar and used with high caution. Town of Gulbene uses the flag adopted in 2002 (as it correctly wrote Gvido Petersons). The flag consists of two stripes: silver light gray and blue-grayish-violet. The coat of arms placed in the centre of the flag.